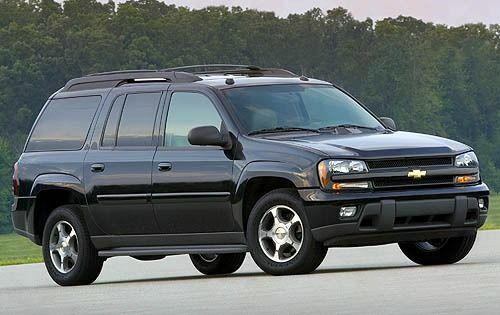 Affected by today’s recall are 231,000 model year 2006 Chevrolet Trailblazer EXT and GMC Envoy XL and 2006-2007 Chevrolet Trailblazer, GMC Envoy, Buick Rainer, Isuzu Ascender and Saab 9-7x vehicles sold worldwide. The recall impacts 193,652 SUVs in the United States; 3,546 in Canada; 4,876 in Mexico; and 30,000 outside North America. According to the National Highway Traffic Safety Administration, fluid can enter the driver’s door model on affected vehicles, causing corrosion that may result in a short in the circuit board. The short circuit may result in the power window switches and power door locks to work intermittently or not at all. In some cases, the short may lead to overheating and/or a fire. Fires can occur even when the vehicle is not in use. GM will begin notifying Chevrolet, Buick, GMC, Isuzu and Saab dealers July 24, 2013. Authorized dealers will test the driver’s door module on all affected vehicles. If the module is found to be functioning properly, dealers will apply a protective coating. Dealers will replace any door modules that are not working properly, free of charge. In the meantime, GM is directing owners to park their vehicles outside until their vehicle has been repaired. Buick owners may contact the owner center at 1-800-521-7300, Chevrolet owners at 1-866-694-6546, GMC owners at 1-866-996-9463, Isuzu owners at 1-800-255-6727, and Saab owners at 1-855-880-0808. GM's campaign number is 12180. Concerned customers may also contact the National Highway Traffic Safety Administration’s Vehicle Safety Hotline at 1-888-327-4236 or go to www.safercar.gov. The NHTSA campaign number is 13V248000. This weekend’s recall is GM’s second recall of 2006-2007 SUVs over door fire concerns. In August, GM recalled nearly 250,000 older model SUVs sold in 20 “salt belt states”—including Connecticut, Delaware, District of Columbia, Illinois, Indiana, Iowa, Maine, Maryland, Massachusetts, Michigan, Minnesota, Missouri, New Hampshire, New Jersey, New York, Ohio, Pennsylvania, Rhode Island, Vermont, West Virginia, Wisconsin. Click here to read Torque News’ coverage of GM’s August door fire recall. Both recalls stem from a government probe, which was launched in February 2012. According to the NHTSA, it received a total of 83 complaints, 66 claiming the door module had burned or melted, and 17 stating that window switches worked erratically or not at all. Most disturbing is that 28 reports specify that the defect led to door fires—some even occurring while the vehicle was not in operation. As for the current recall, six fires occurred in the 231,000 new vehicles being recalled and one injury.